So, this monster of a post has taken me quite awhile. There are 14 colors in the Salon Perfect line. Since it is a new line, I wanted to be sure to wear each one so I could report back on wear time. With apologies for the delay, please enjoy all the pictures of these lovely new polishes! Pictures first, and reviews at the end! Lots of pretty colors, huh? 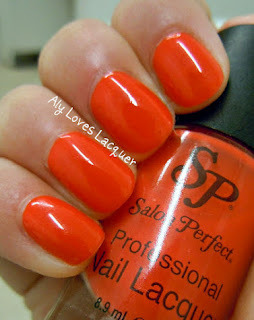 I was impressed by the range of colors and finishes in the Salon Perfect line. There are your classic pinks and reds, but also some night brights like Lemon Zing and Kiwi Lime. As far as application, most of these polishes were awesome! Spicy Tomato, Tangy Tangerine, Kiwi Lime, and Berry Blue all have a nice jelly crème finish. That was an unexpected surprise. While I love a jelly finish of any kind, it is important to note that most of those polishes do take 3 coats to reach opacity. I did have some trouble with the formula on Lemon Zing and Lavender Icing. Both were quite think, but still look nice on the nail with no bubbles. You could always add a few drops of thinner if you prefer an easier application. So, there you have it! I hope you enjoyed all the pictures. Overall, I was impressed by Salon Perfect. I was not sure what to expect, but I really like many of these shades and finishes. These polishes can be found at Walmart for $2.98 a bottle. I'm really digging the green and for just under $3, that's a pretty sweet deal! These are all really pretty! Lemon Zing is an awesome yellow and I like Soft Lilac too.